Last year we had the pleasure and the honor to host several local struggles and technological projects, all of which had important experiences to share as new types of struggles or projects using new technologies, all oriented towards growing autonomy and bypassing outdated ideologies and methods of struggle. Some of these have seen their struggles continue in spite of severe repression, as with Bure and Hambach, and in the most spectacular case of the ZAD, they have delivered the first popular victory in a long time against the projects of state and capital, and have moved to the forefront, both in a symbolic and real sense, of French and global radicalism. 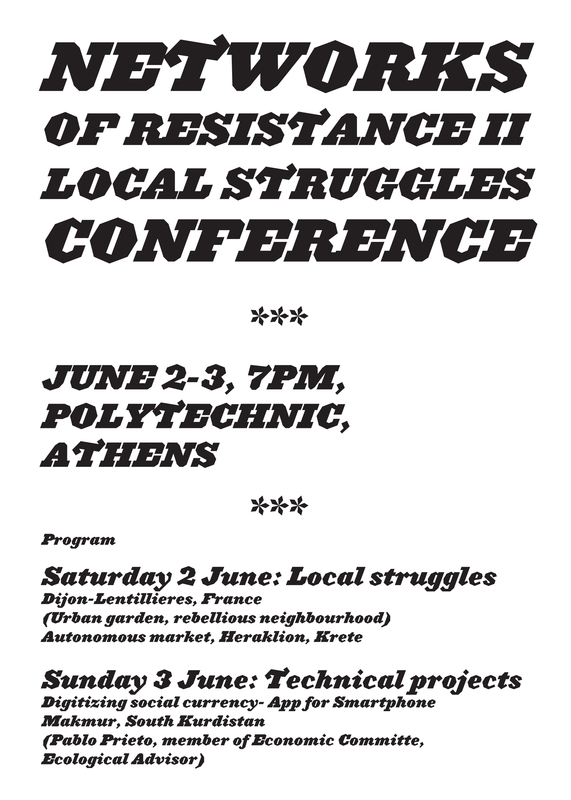 Last year we had the pleasure and the honour to host several local struggles and technological projects, all of which had important experiences to share as new types of struggles or projects using new technologies, all oriented towards growing autonomy and bypassing outdated ideologies and methods of struggle. Some of these have seen their struggles continue in spite of severe repression, as with Bure and Hambach, and in the most spectacular case of the ZAD, they have delivered the first popular victory in a long time against the projects of state and capital, and have moved to the forefront, both in a symbolic and real sense, of French and global radicalism. In our view, the past year has only confirmed such a perspective, and the necessity of further practical work along those political lines. This is why we decided to invite new groups this year, hoping to spread associations and ideas in this way, working towards the idea of a federative connection of local struggles beyond borders, uniting themselves through radical political ideas and open-source technological methods. This constitution of a network of networks, a movement of movements, has a promise to replace the old hierarchical and bureaucratic formation of the Party and Trade Union, to be the new form of horizontal organizing to take up the struggle after the disappearance of the workers’ movement. These may seem large proposals, but even a quick glance at the news can confirm that these are the dramatic and monumental times in which we live, and we have to be at the historic level of the occasion, to live the type of lives we want to, to write a new page in the historical book of resistance.